Conservative family groups are seeking to force Canadian schools to require them to alert parents when their children join LGBTQ groups on school campuses. The Albertan law, Bill 10, bars notification of parents on GSA membership, and is now facing its first legal challenge in a court in Medicine Hat. The Justice Centre of Constitutional Freedoms, a non-profit legal organization based in Calgary, is representing a number of such groups seeking to put the law on hold pending a ruling on whether Bill 10 is constitutional. In its argument against the law, the Justice Center claims that disallowing parental notification violates freedom of religion and expression. 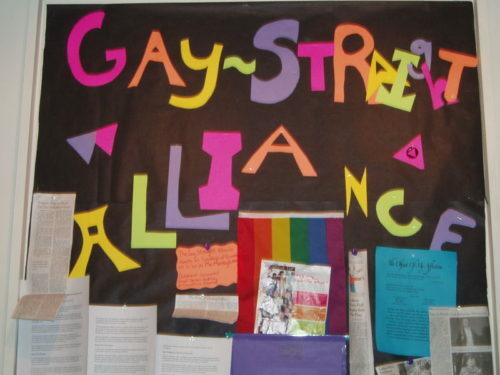 “GSAs are ideological clubs, embracing and promoting a wide range of sexual expression that is incompatible with the morality of many faiths, including most denominations of Christianity, Islam and Judaism,” wrote the Justice Centre’s President, John Carpay, about the law in the Alberta Home Education Association’s newsletter. “By imposing ideological clubs and activities on every school, Bill 10 removes the right of parents to have a meaningful say about the culture, character and learning environment of the schools that their children attend,” he added. The government disagrees, and feels that its opponents are misstating the role that GSAs play in their students’ lives. “(The applicants) speculate that GSAs are clubs aimed at providing children with sexually explicit material and at making children vulnerable to being preyed upon,” says the government in legal filings on the case. Bill 10 disallows such notification out of concern that “outing” students to unaccepting parents could have a negative impact on students. “You shall not out children. It’s as simple as that,” John Carpenter, speaking to the court on behalf the government. The complain was signed on by many parents, who seek to know what influence GSAs may have on their children, Two in particular claim that their child, who is autistic, began to present as male after joining their schools GSA, and later became suicidal. Others claim that it would be the lack of GSAs that would lead to self-harm. The case was well attended, with the 50-seat courtroom at capacity and an additional 100 or so outside. Many who attended wore pins of held signs for or against Bill 10. Johanna Kubik, the judge presiding over the case, has promised a swift decision, given the looming deadline for school’s to prove compliance.